Product Search - Ex. : 223, 9mm, shooting rest, cleaning, etc..
100 round shotshell carrier for the shotgun Sports. It has been designed to take only shotshells and cell phone to shooting line or field. 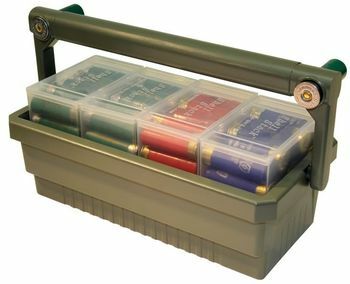 It comes with FOUR MTM Shell Stackers 12ga. 2 3/4” clear shell boxes and easily holds 4 12 Ga. 2 3/4” cardboard shell boxes. Strong comfortable fold over handle, has two 12ga. only grippers, for extra shells for do over shots. Slot alongside caddy is for storing box lids or smart phone. Also, can be used with 20ga., 28ga. down to 410ga..
• Comes with FOUR Shell Stackers 12ga. 2 3/4” clear shell boxes. • Holds 4 12 Ga. 2 3/4” cardboard shell boxes and excellent 410 20 28Ga. • Handle has two 12ga. only grippers for extra shells for do over shots. Outside Dimensions: 12.6" x 7.1" x 4.8" High with handle down.